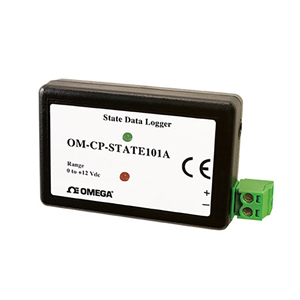 The OM-CP-STATE101A is one of our newest data loggers. It is part of a new series of low cost, state-of-the-art data logging devices that has taken the lead in offering the most advanced, low cost, battery powered data loggers in the world today. The OM-CP-STATE101A offers a 10 year battery life, 4 Hz reading rate, a multiple start/stop function, ultra-high speed download capability, 406,323 reading storage capacity, optional memory wrap, battery life indicator, optional password protection and more. The OM-CP-STATE101A senses input transitions or contact closures from external sources such as transducers and/or state initiators and records the time and input state of the device when a transition occurs. Once activated the data logger senses and records transition or state changes at the input. The device’s real-time clock ensures that all data is time and date stamped. The storage medium is non-volatile solid state memory, providing maximum data security even if the battery becomes discharged. The device can be started and stopped directly from your computer and its small size allows it to fit almost anywhere. Data retrieval is simple. Simply plug it into an available USB port and our user-friendly software does the rest. The software converts a PC into a real-time strip chart recorder. Data can be printed in graphical and tabular format or exported to a text or Microsoft Excel file. The OM-CP-STATE101A was designed with our customers in mind. We offer free firmware upgrades for the life of the product so that data loggers already deployed in the field can grow with new technological developments. Units do not need to be returned to the factory for upgrades. The user can do this automatically from any PC. Press and hold the pushbutton for 5 seconds, the green LED will flash during this time. Press and hold the pushbutton for 5 seconds, the red LED will flash for three seconds and then the green LED will flash for two seconds. The device has stopped logging. Engineering Units: Native measurement units can be scaled to display measurement units of another type such as on/off, open/closed and more.